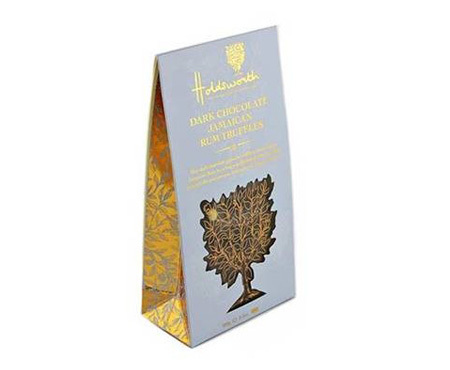 Using rich dark chocolate this ganache truffle infused with a wonderful Jamaican Rum is perfect for any dark chocolate lover. These Rum truffles make an excellent gift and conjure up that caribbean holiday feeling. This ‘Treat bag’ also comes in Marc de Champagne, Sea salt Caramel truffles & Orange truffles – Click to view. Ingredients: Dark Chocolate 64% (Cocoa Mass, Sugar, Cocoa Butter, Emulsifier: Soya Lecithin, Natural Vanilla), Fondant (Sugar, Glucose (Wheat), Water, Preservative: Sulphur Dioxide), Butter (Milk), Alcohol (Rum 4%), White Chocolate (Sugar, Cocoa Butter, Whole Milk Powder, Emulsifier: Soya Lecithin, Natural Vanilla), Natural Flavouring (Propylene Glycol), Rum Essence (Flavouring Preparations, Non Natural Flavouring Substances, Thickening Agent: Xanthan Gum, Caramel Sugar Syrup, Citric Acid, Preservative: Potassium Sorbate, Ascorbic Acid).